This new series introduces Okinawa's culture and history from a different viewpoint. Our previous issue focused on the gusuku castles that are for headed registration as World Heritage Sites. In this new series, we will bring you the aura and contours seen in the pottery and textiles that Okinawa has nurtured within its history and environment. We hope you will enjoy the unique tints and forms that these crafts display. Traditional Okinawan pottery is generally classified into two categories: One is Yakishime-style unglazed Arayaki were(otherwise known as Nanban ware), and glazed Joyaki ware. The unglazed ware consists of crocks and jars, and the glazed ware consists of everyday utility items. During the ancient Ryukyu Kingdom this pottery was fired to meet demand within the kingdom. For this reason, it is often said to be simple and unsophisticated pottery. This style developed from the flourishing trade that the Ryukyu Kingdom had with Southeast Asia in the 15th and 16th centuries and was learned after contact with the Southeast Asian style of making liquor jars. This pottery is thought to have been first produced in the Kina area of Yomitan Village. It is well suited to production of storage containers for unhulled rice, soybeans, foodstuffs such as miso (soybean paste), and is essential for aging awamori (an Okinawan distilled spirit). Arayaki was the chief production item of potteries here until before WWII but demand dropped off after the war due to changes in the lifestyle of Okinawans. This type of glazed ware was introduced by three Korean potters who were sent to the Ryukyus by the Satsuma Domain of Kyushu in 1616, almost directly after the Satsuma invaded Okinawa in 1609. Around this time Japanese feudal war lords in many domains, received Korean potters forcibly brought back to Japan after armed incursions into Korea. The potters were relocated throughout Japan and began to found kilns there. One of those potters, Cho Ichiroku also known as Cho Kenko (Japanese name Nakachi Reishin) did not return to Korea and settled in the Wakuta area of Naha. With a base provided by Korean production methods, further great developments in glazed Joyaki ware were achieved by a potter named Hirata Tentsu. In the late 17th century he was sent to China by order of the Ryukyuan king to study ceramics. Upon his return he made the dragon head roof tiles for the Seiden Hall of Shurijo Castle as well as conical Tenmoku tea bowls. 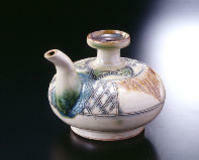 Joyaki pottery thus made the transition from everyday utility ware to items of fine art. Hirata is said to have been the person who introduced the Akae overglaze enameling techniques, considered to be the highest quality ware in Okinawan ceramics. In the first half of the 18th century a potter named Nakandakari Chigen went to Satsuma and studied the production methods of the potters there. The ceramics produced in the Ryukyu Kingdom era were similar to the other traditional arts and crafts of Okinawa that were influenced by the techniques of Southeast Asia, Korea, China, and Japan. 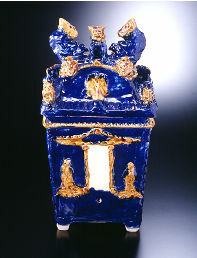 The glazing techniques and designs were incorporated into the techniques here and an original aesthetic emerged. 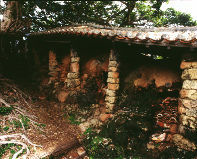 After the return of Hirata to the Ryukyus, the royal government consolidated the Chibana kilns (present day Okinawa City), the Wakuta kilns (Naha City), and the Takaraguchi kilns (Naha City) in to a central location in Tsuboya, Naha City as part of measures to promote the development of ceramics in the Ryukyus. Since that time Tsuboya developed into the largest pottery area on Okinawa and the name Tsuboya has become synonymous with Okinawan ceramics. After World War II, the kiln firings of Tsuboya became the beacon of recovery for Naha City, which was left in ruins from the battles fought there. However, as the area became residential the air pollution from the Noborigama climbing kilns became an issue and the use of the kilns was restricted. Due to this, the kilns were moved out of Naha to various places around the prefecture. At present, there are about 15 studios in Tsuboya and over a hundred throughout the prefecture. The traditional pottery of Okinawa is simple in shape, often with bold decoration and has an overall unhurried feel to it. In recent years, the diversification of culinary and life styles has been reflected in the production of a wide range of pottery styles. However, traditional Joyaki glazed ware such as aramakai food bowls, karakara awamori pots, dachibin flasks, yushibin ceremonial sake bottles, and other utility items as well as the jiishigaami burial urns are still produced. 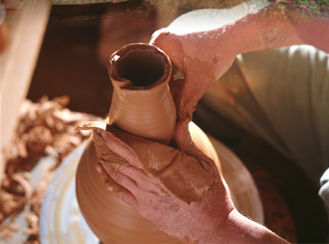 The clay mixture used is determined by the item being produced. On the potter's wheel forming is done in the counterclockwise direction, opposite to that of most potteries in Japan. Traditional glazes include ash glaze, a yellow-brown iron glaze called ame-gusuri, green zaffre from brass and copper, and Gosu cobalt blue glaze. Some of the pieces are decorated with slip when leather-hard and incised or finger-painted with arabesque patterns, human figures, fish, and shrimps. The potters of Tsuboya offer liquor, rice, and salt in prayer to the kiln when starting to fire and refer to the pots as having been "born" when they emerge from the kiln firing. Currently, in the ceramic studios of Okinawa, traditional methods are being augmented with the creative skills of the artists and new styles of Okinawan ceramics are being born.